Alternatively, some kind of TV could play back a "video" of what to do (shaders using frames of textures is pretty easy to pull off). I thought about copying the movement data of a real player's demo to a bot and script the bot so it effectively moves just like the player did and then you could spec it from within the game (without even needing to leave the game)? That would not need any video data, just movement information? Having elements from existing map as Smilecythe suggested is also a good idea. Orange squares represent teleporters which takes you to other rooms. With "episodes" I mean levels of the single player campaign. It could be an episode system like in Quake1 or it could go straight into levels. What you guys think? Edit: This is basically a bridge between the tutorial and single player campaign which would be accessed whenever players go "new game". We should have two tutorial paths (i.e. teleport entries) - weapons and movement. I think it makes sense to separate those two as you might not always want to go through the entire weapon lessons if you happen to want to look a movement technique and vice versa. Does Xonotic have game modes for practice/training? In a training mode the timer should count up (so players can do speedruns) and the timer should be triggerable and resetable via in-map triggers. Also, it would be possible for the mapper to have a trigger to disable weapon fire - in a movement/strafe jump tutorial, players shouldn't be able to splash-jump! I've started on a very simple training map, I'll post it tomorrow (Sunday) evening. You can check out maps hosted on CTS servers, how they do it. 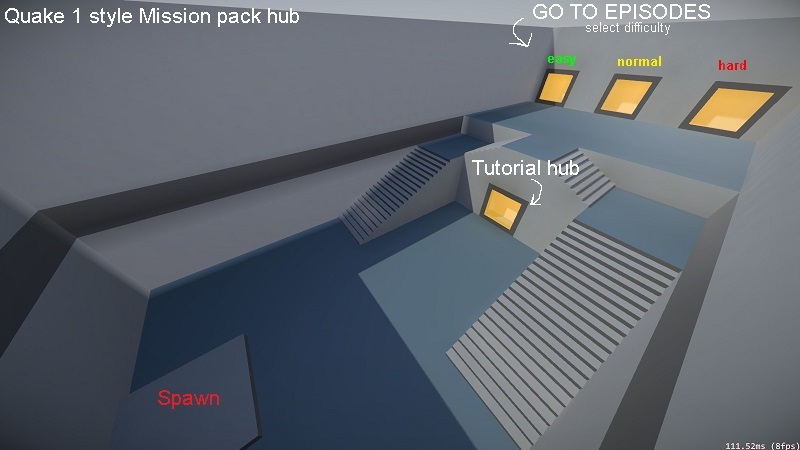 If you are interested in doing training maps, your help would be much appreciated for realizing the concepts for the official tutorial and training maps once the concept has been finalized. So far only one other mapper volounteered, and he certainly won't manage to do everything alone (I guess). Here is the concept map of how I think the training could/should be done. What this map needs is a new gameplay mode, one that disables weapons and causes the timer to tick upwards, but only when triggered. (01-17-2016, 11:40 AM)munyul Wrote: Here is the concept map of how I think the training could/should be done. When you enter a teleporter all your vertical/horizontal velocity will be turned to horizontal velocity as you exit. In your map you can stack up speed infinitely the way those teleporters are aligned, just saying. Also, some jumps are possible to reach with forward speed only (meaning you only press forward and jump at the right time) I don't see the point of having those. I like the idea of strafe pads / platforms that you need to strafe jump through like in Quake Live, but if you're going to create a training course similar to Quake Live, you should include some jumps from actual maps. (01-17-2016, 02:10 PM)Smilecythe Wrote: When you enter a teleporter all your vertical/horizontal velocity will be turned to horizontal velocity as you exit. In your map you can stack up speed infinitely the way those teleporters are aligned, just saying. Yes, I know... I tested that on the long strafe-jump set in section A, I got enough speed to clear that in 2 jumps and running face-first into the wall on the other end did around 70 points damage! (01-17-2016, 02:10 PM)Smilecythe Wrote: Also, some jumps are possible to reach with forward speed only (meaning you only press forward and jump at the right time) I don't see the point of having those. (01-17-2016, 02:10 PM)Smilecythe Wrote: I like the idea of strafe pads / platforms that you need to strafe jump through like in Quake Live, but if you're going to create a training course similar to Quake Live, you should include some jumps from actual maps. I don't quite agree, because over time it's possible maps will change. But, I guess, it wouldn't hurt to base some tasks on actual maps. (01-17-2016, 02:37 PM)munyul Wrote: I don't quite agree, because over time it's possible maps will change. But, I guess, it wouldn't hurt to base some tasks on actual maps. If with change you mean "what's played at the moment", as in the top favorites of the community.. some maps stick forever, like Final Rage has been around the top favorite duel maps god knows how long. If with change you mean layout/geometry changes (remakes/ports) that affect the difficulty of certain tricks, that happens even less. Your Final Rage has been remaked twice (I think) and neither times did any of the key trick jumps get altered. The kind of map you made for concept in my opinion belongs to defrag, where it's more common to have unnatural geometry for maps made for fighting. If there's going to be a tutorial it should include geometry and useful tricks from popular ffa/ctf/duel maps. @Smilecythe, okay so some maps might not change much in layout design over time - though I know for a fact that the current version of Final Rage has had some elements removed, which has changed the gameplay/gameflow a little. The players are the obvious (and main) target audience for the maps, so that players can practice movement. Target practice is best in a "real" map against simple bots. Mappers are the second and far less obvious target. If the training maps are simple "copies" from actual maps, there is no real inspiration for new ideas/designs. Creating abstract training maps and extreme elements/jumps would show both players and mappers what is possible - and this might lead to entirely new ideas/designs!? Well that's just why the defrag mod (cts) with easily over thousand maps exists. If in your mind tutorial should force players to stretch the exploits of the engine to the extremes then it's already there. I'm basing what I said earlier on the success of Reflex's tutorial map, you go through a linear path with pieces of geometry from popular maps. Albeit the execution could be better, the map manages to provide for both new and old players alike. I've seen servers full with hordes of players (both new and old) spending hours trying to clear the map. I'm just worried that taking geometry of existing maps would generate additional effort as we would have to update such a movement training mission everytime we update the relevant parts in stock maps. However I believe it depends on how this is implemented, not every change to stock maps would apply to the relevant trickjump geometry. In any case we would have to make sure to connect the passages of different maps in a way that allows us to easily exchange mission parts of a given map. A method could be teleports or warp zones, though we have to be careful how to design the latter to avoid lines of sight travelling through several warp zones. If we take parts of existing maps we will have to modify such parts so that we block alternative paths. For example we could place glass barricades that you cannot blaster off from, so that you can see the rest of the map and can easily recognize the spot in later games, but have to follow a linear path. This way you could set up a path through an entire map showing various trickjumps. I imagine glowplant would be a fantastic candidate for this. We could then place "hint" buttons at tricky spots, which would make a semi-transparent movement path appear through the air to show the path you're supposed to take (for people that wonder "whaaat, where do I have to go"). Ideally, the path should be visible only to the player that triggers the button (for multiplayer games where some people may want to find out themselves). This way we could make a rather big, linear, tricky and fun map I believe. However, I still think that we should have a very basic movement tutorial part that explains in detail certain isolated techniques. I don't think explaining strafe turning technique for example would be reasonable within such a cts map made of stock map parts/paths. I favor the idea to keep the tutorial map in very simplistic, artificial textures that emphasize the geometry but do not feature any details at all. Such a movement tutorial map should of course be optional to complete and serve as a reference to look techniques up or as an introduction to such techniques should you never have heard about them. I think I will try to draft a more or less complete and detailed concept of how I think the tutorial can be implemented basing on the ideas discussed here and on the piratepad, and present that to the team for approval. It should be noted, that you can't see warpzones through warpzones, recursion was fixed a while ago.